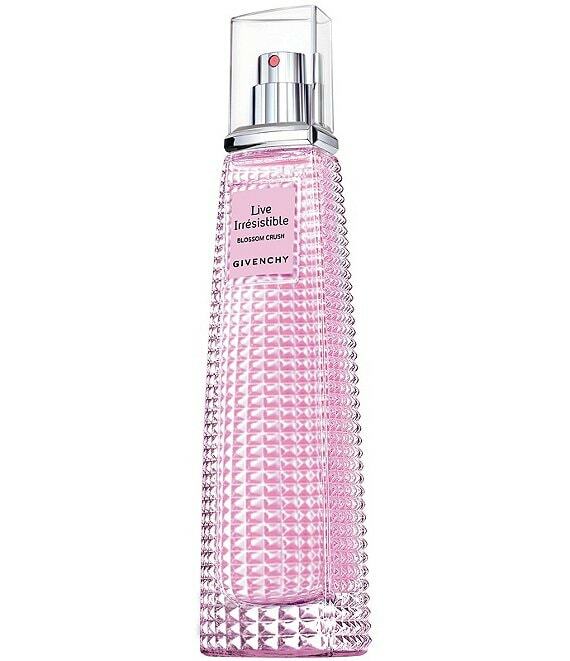 Live Irrésistible, Givenchys most joyful fragrance, boldly sings the praises of joy in its purest form. Blossom Crush is a sparkling and irresistibly charming Eau de Toilette that advocates spontaneity as an asset and freedom as power. Just like its unpredictable heroine, Live Irrésistible Blossom Crush is an astonishing floral bouquet. It reveals an abundance of fresh, delicate petals of roses and peony with a twist of cocoa bean, the unexpected ingredient which tinges the fragrance with a bittersweet note for an immediate crush. Adorned with the Givenchy Houses trademark studs enhanced with a luminous lilac hue, the slender facetted bottle is a fresh and modern remedy against the blues. With Live Irrésistible Blossom Crush, delicateness turns into impertinence, and the crush becomes love at first sight.